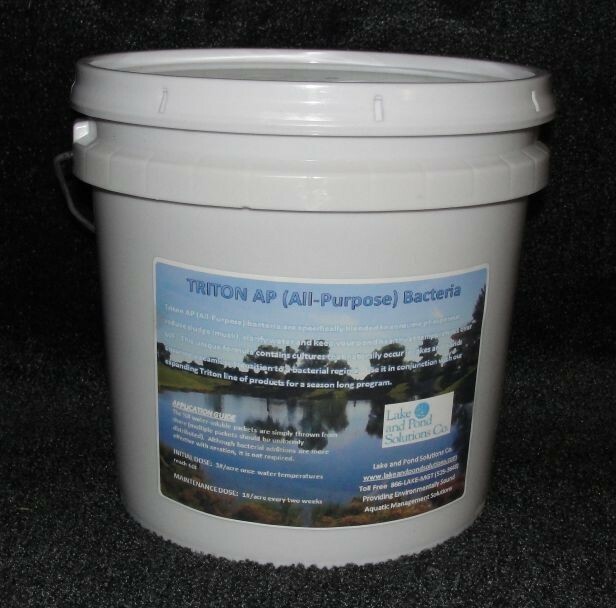 Triton AP (All-Purpose) bacteria are specifically blended to provide nutrient uptake and muck reduction. It establishes a healthy bacterial population in your pond to consume phosphorus, reduce sludge (muck), clarify water, and keep your pond and fish healthy. Triton AP (All-Purpose) bacteria are specifically blended to provide nutrient uptake and muck reduction. This unique formula contains many bacterial cultures that naturally occur in lakes and ponds ensuring a seamless transition to a bacterial regime. Triton AP establishes a healthy bacterial population in your pond to consume phosphorus, reduce sludge (muck), clarify water, and keep your pond and fish healthy. APPLICATION RATE: Triton AP is applied at 3 lbs/acre initially and then 1 lb/acre every two weeks. Application is easy as the bacteria are packaged in 1/2# water-soluble packets that can be tossed out into the pond from shore. Water temperatures should measure at least 60F before starting this bacterial regime. Although bacterial additions are more effective with aeration, it is not required. For help in determining acreage and volume, please visit our Acreage and Volume Calculations page.